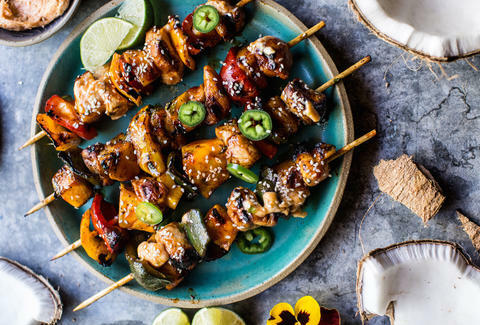 When hosting a cookout, the main thing you have to worry about is making sure that everyone eats both well and enough, which can be a tricky feat when you're dealing with varied diets. 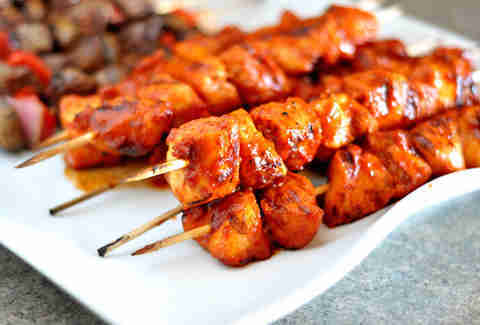 But kebabs, those skewers of grilled meat and vegetables, might just be the perfect solution. They are crazy easy to put together, have a bunch of different ingredients and textures, and cook up quickly. Plus, they look a whole lot fancier than they actually are. 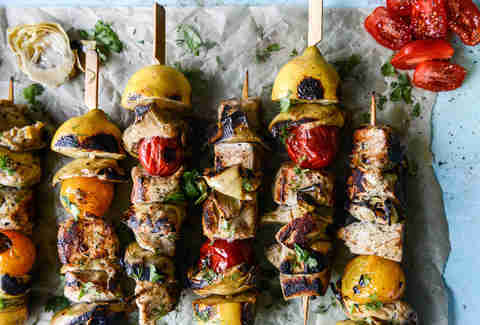 So the next time you're tasked with cooking for a crowd, consider these kebab recipes. It's best to marinate the chicken overnight, but if you're strapped for time, 30 minutes is totally acceptable. Shortcuts won't matter once you pair that poultry with artichoke hearts and a creamy yogurt goat cheese dressing. 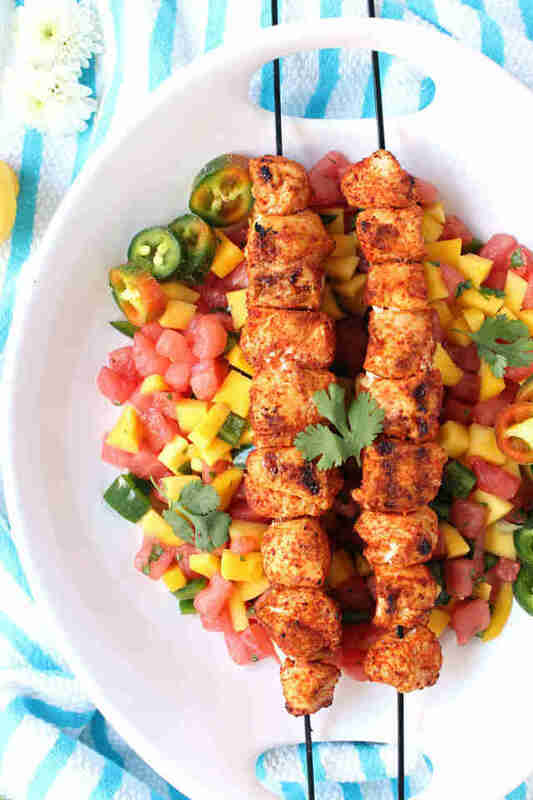 Serve 'em up with warm grilled pita and a simple salad for an easy summer dinner. Get the recipe here. 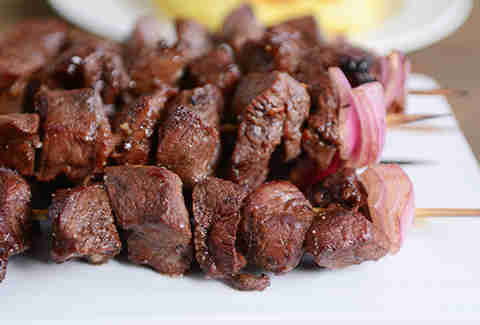 What makes these beef skewers special is the easy balsamic vinegar, mustard, oil, and herb marinade. 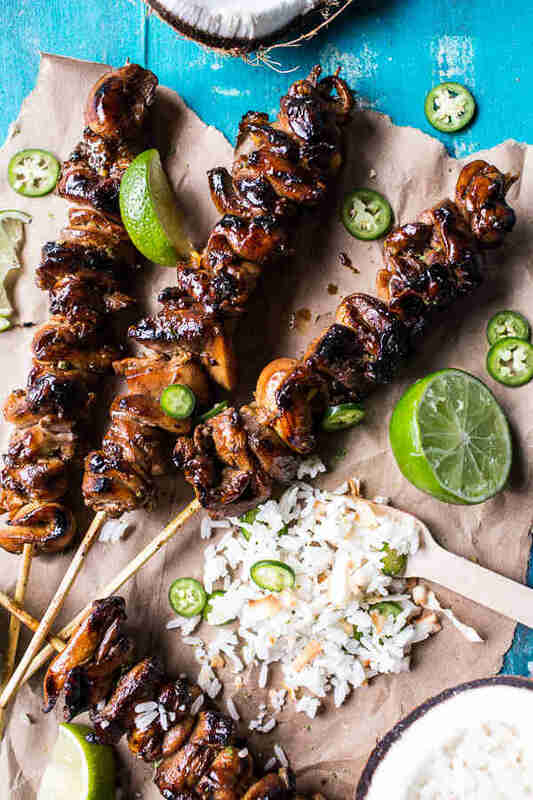 Add red onion to your skewers before they hit the grill -- the heat will sweeten them up! Recipe here. Dress the breasts in coconut milk, soy sauce, lime juice, honey, and vinegar, then simmer down the remaining marinade into a sticky sauce. Find the recipe here! 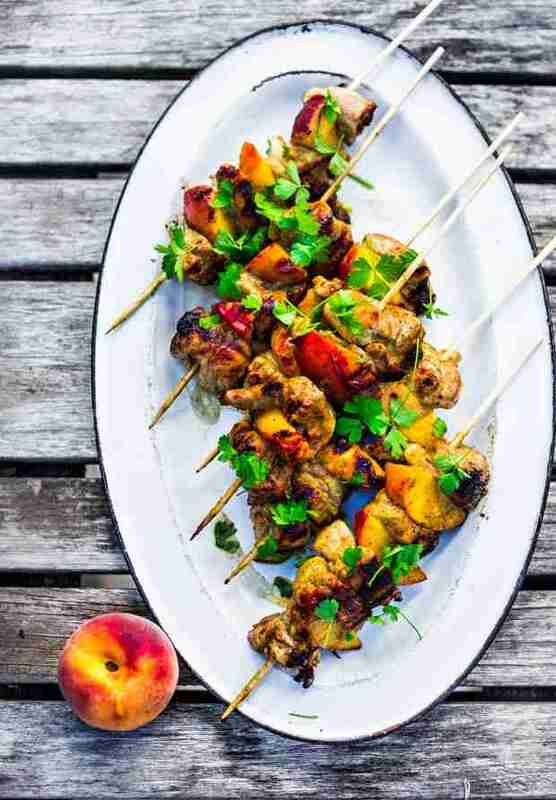 These chicken kebabs start with spicy-and-sweet jerk flavors -- brown sugar, molasses, cinnamon, ginger, allspice, Scotch bonnet -- and are then complemented with fresh sweet peaches. Learn the recipe here. If semi-homemade is your style, here's a little secret: this chili-lime spice rub is totally store-bought -- Trader Joe's has an excellent version, but so do the standards like Mrs. Dash and McCormick. Find the recipe here. 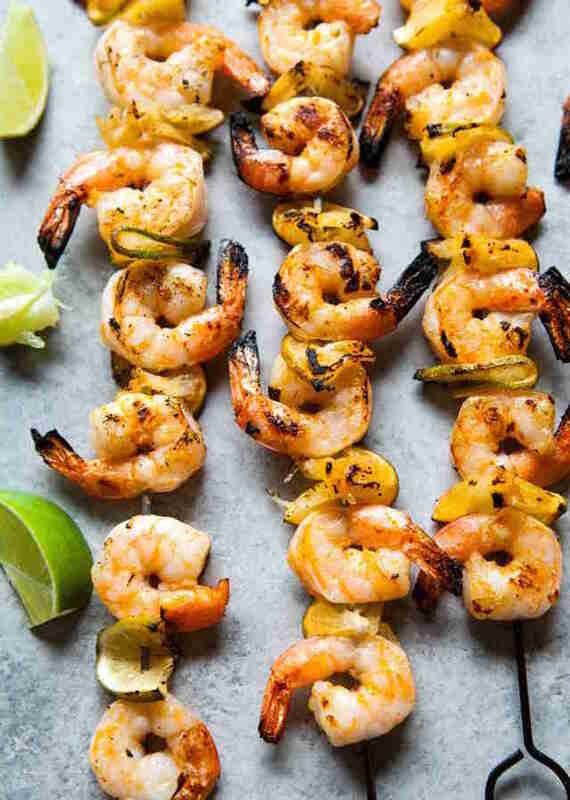 These Sriracha butter-grilled shrimp-and-lime skewers couldn't be easier. We've already told you all the ingredients. Check out the recipe here. 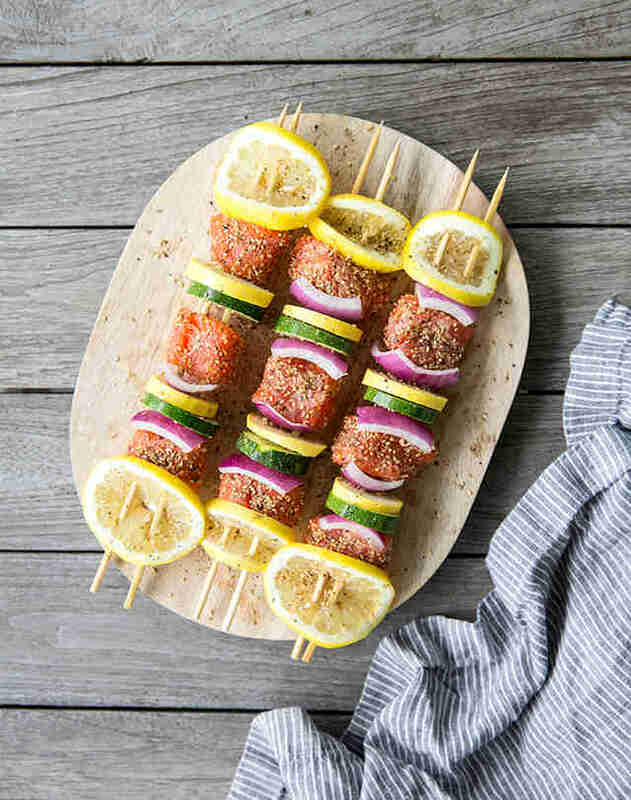 The simple salmon-and-squash skewers can stand on their own, but paired with a sweet-and-salty ginger scallion relish and lemongrass rice, they really sing. Use two sticks per skewer so that the fish and vegetables stay in place. Recipe here. 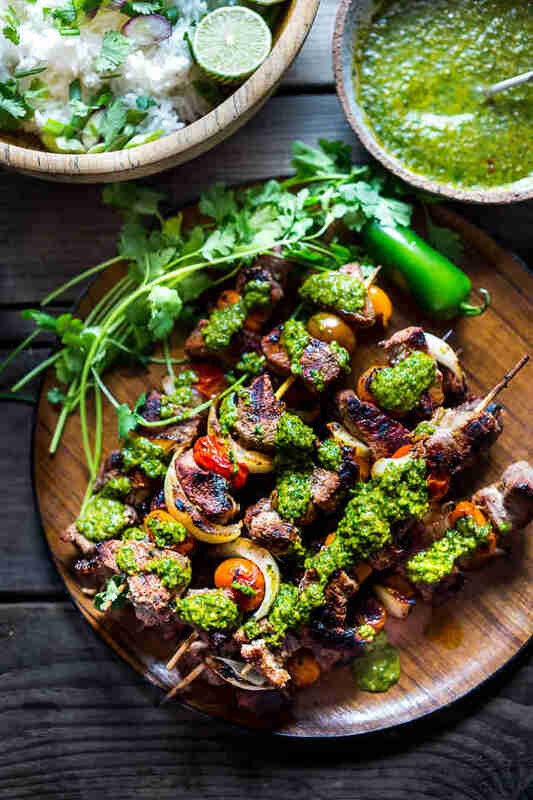 Alternate the steak with sweet onions and cherry tomatoes on the sticks before grilling, and then double down on the smokiness with paprika-spiked chimichurri sauce. Recipe here. Forget everything you know about ordinary BBQ chicken, because this meat is marinated in a blend of BBQ sauce, sugar, and spices, and then coated with a pulsed bacon paste that'll make everything extra crispy and salty. Here's the recipe. 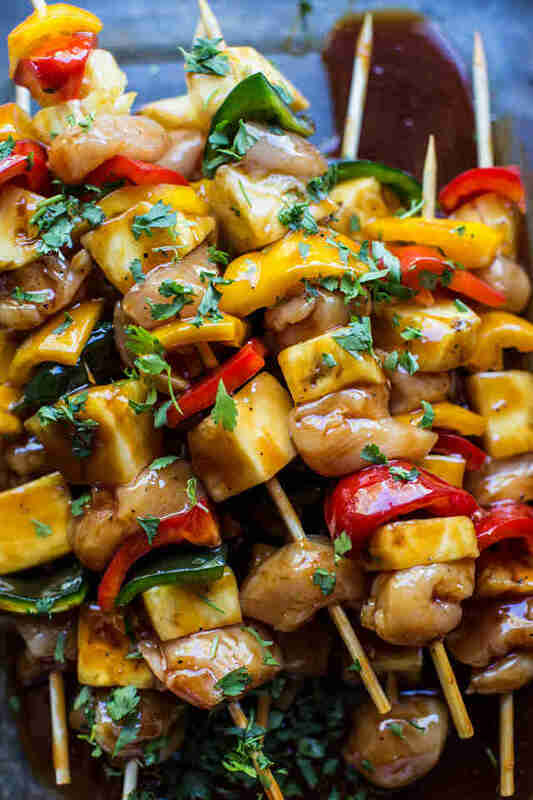 Toss the chicken, pineapple, and peppers in your favorite BBQ sauce, and then finish it all off with a brush of Sriracha butter. Get the recipe here. 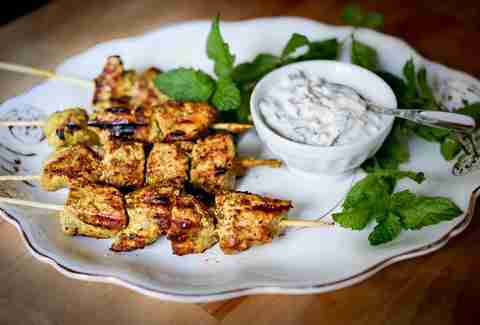 The tandoori marinade can be paired with just about any meat or vegetarian alternative, and the cool cucumber yogurt raita will temper any heat from the chiles. Get the recipe here. Sophie Hays is a freelance writer from New York City, where she can be found searching for the next great plate of homemade pasta or recipe testing in her tiny kitchen. Follow her on Twitter: @SophieHays_.